KEYNESIAN (MARXIST) ECONOMICS LAUREATE JOSEPH STIGLITZ ADVISES FINNISH PM ”NOT TO WORRY ABOUT THE DEBT” – The Tundra Tabloids……. That’s right, pile it on! That this economic huckster got a Nobel prize shouldn’t surprise you, nor should Obama’s. He’s not even adhering to failed Keynesian economics that he’s promoting, according to which, during times of plenty, the government is to bank a surplus for times of recession. They’re not even doing that, instead, pile on massive amounts of debt, as if the welfare state will kickstart itself through the master planning of these self deluded ”geniuses”. NOTE: One noticeable thing about the man, is that he’s against supply side economics, he’s anti-Reaganonimics, the man responsible for the longest uninterrupted growth in the US economy in its entire history. And of course YLE, the Finnish state news broadcaster slobbers all over the man. Stop obsessing about government debt and focus more on how to stimulate economic growth. That’s the advice from leading economist and Nobel laureate Joseph Stiglitz to Prime Minister Juha Sipilä. 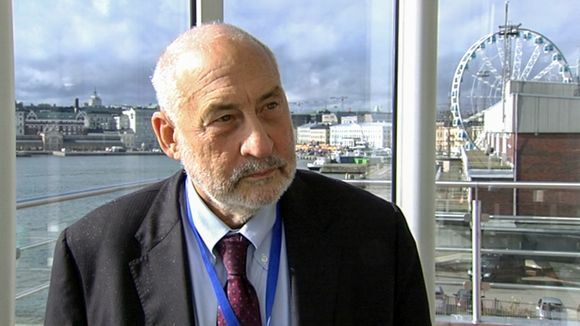 Speaking to Yle during a visit to Finland last Friday, Stiglitz reminded policy makers that the primary purpose of economic growth is to improve rather than weaken individuals’ living standards. The visit of world-renowned economist Joseph Stiglitz to Finland coincided with Friday’s massive labour demonstration protesting de facto salary cuts to advance government’s stated aim of boosting economic competitiveness by five percent. Stiglitz told Yle that he understood the sentiment driving the outpouring of protest. “It’s very important to strengthen terms and conditions of work and I think this is also a big question in the United States,” he added. The Columbia University professor noted that the US is experiencing the same problems as Europe: while labour productivity has grown, workers themselves have been standing still. “Labour productivity has doubled in 35 years but workers’ compensation has stagnated, stopped. All of the returns from increased productivity go towards maximizing profits and that is wrong,” he declared. Stiglitz took the opportunity to remind policy makers of the fundamental purpose of economic and GDP growth. “GDP has no intrinsic value. There is only one good reason to increase GDP and that is to improve peoples’ standard of living,” he pointed out. Known for his strong opposition to austerity programmes, the sometimes-controversial economist said that it was incomprehensible that peoples’ living conditions and labour contracts were being eroded in order to boost GDP. The visiting economist said he was offering three pieces of free advice to Prime Minister Juha Sipilä and his government. In the first place, he called on the administration to focus on growth rather than government debt. “Don’t be so obsessive about government debt. Think more about how to get GDP growing because at the same time it will improve the state’s debt sustainability,” he advised. A second recommendation from Stiglitz also related to government debt. The economist stressed that it’s acceptable to have debt. “Taking debt to invest in people, infrastructure and technology is a good investment. After all, you’re still able to borrow at low interest rates,” he observed. Stiglitz’s final suggestion targeted the desire to find a “new Nokia”. “The economic structure in Finland must change. What worked before won’t work anymore. You have to find new means of livelihood, new sectors and new ways of doing things,” he commented. The 72 year-old Stiglitz received the Nobel Prize for Economics in 2001 and has worked in high-ranking positions in influential institutions such as the World Bank. He has also held professorships at top universities such as Columbia, Stanford, Oxford and Princeton. During the 1990s Stiglitz also served as economic advisor to then- US President Bill Clinton. The economist visited Finland to attend a lecture by the United Nations University World Institute for Development Economics Research (UNU-WIDER), which took place in Helsinki from September 17 – 19. Previous Post Previous Post SYRIAN REFUGEE CRISIS, NOT SYRIANS, NOT REFUGEES AND NOT A CRISIS……. Next Post Next Post FINNISH GOVERNMENT CLAIMS MUSLIM SETTLER NUMBERS ARE DOWN, RED CROSS REFUSES TO GIVE NUMBERS ANYMORE…….